I indicated that several establishments are now labeling their cuisine as soul food and briefly described three of them: New Soul Food, Gumbo YaYa, and Mama Jackson Soul Food Kitchen. 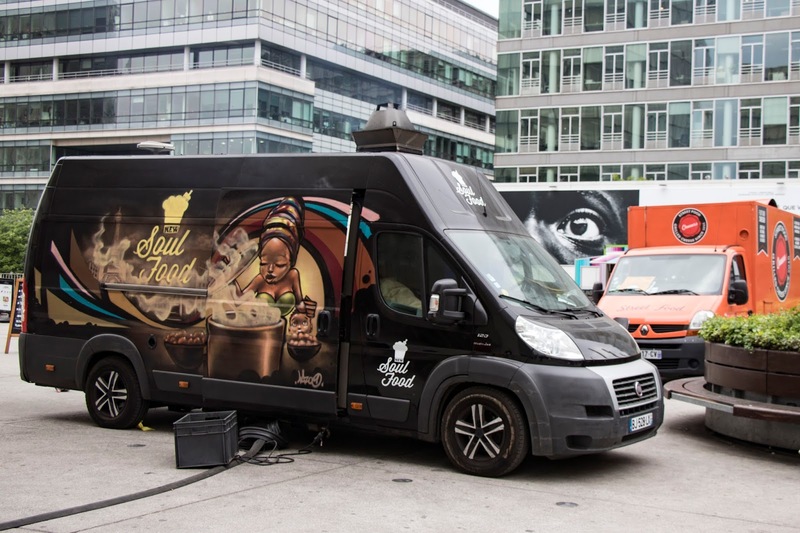 New Soul Food came across my radar again in early April, when they participated in a special day of activities during the spring-summer Africa Now festival being hosted by Galeries Lafayette. My husband Tom brought home a couple of dinners and we quite enjoyed them. 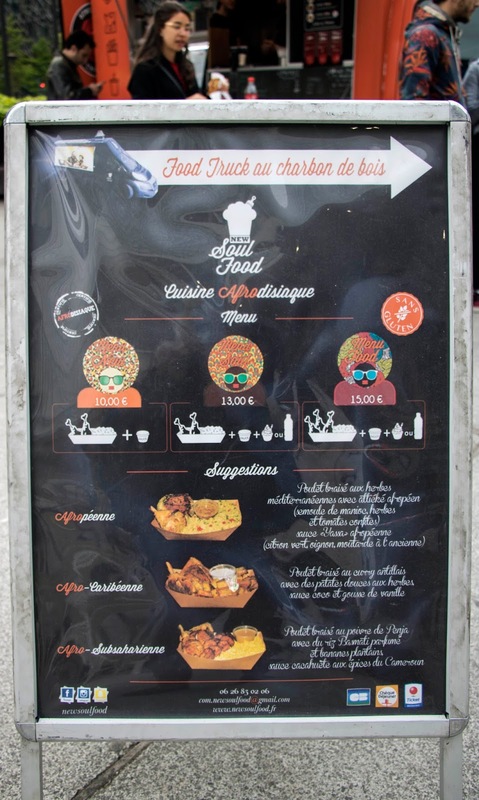 The truck is generally parked on a large plaza at 128, avenue de France in the 13th arrondissement. 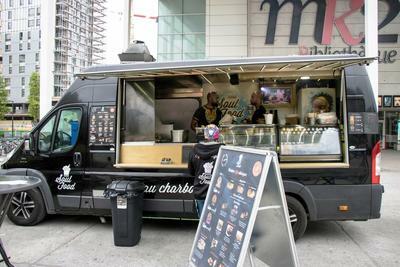 When we visited it on a cloudy Saturday afternoon, it was part of a circle of seven food trucks that provide meals and refreshment for moviegoers at the Cinéma MK2 Bibliothèque and others in the neighborhood. New Soul Food’s cuisine is best described as Afro-fusion. 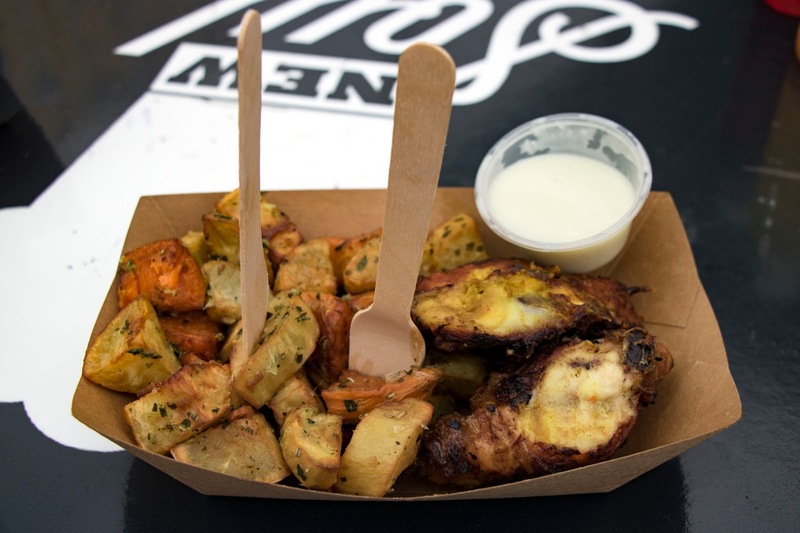 The menu revolves around chicken and fish, both of which are “braisé” – what Americans call charbroiled or grilled. 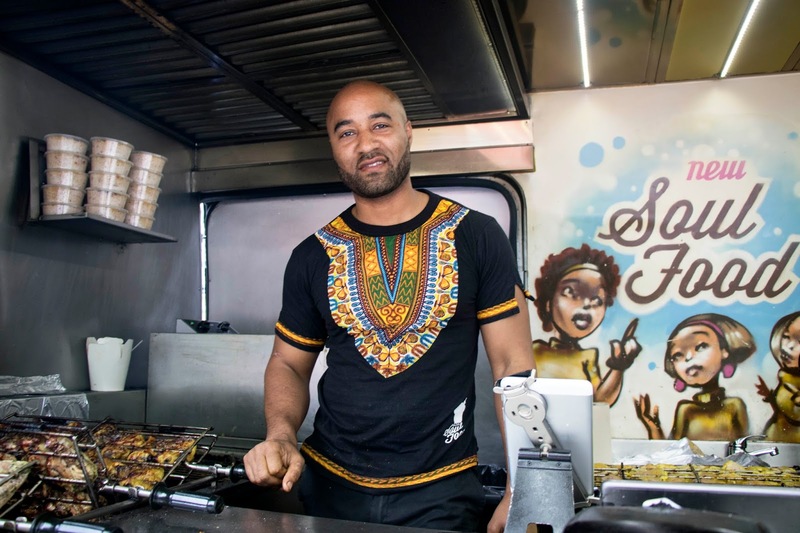 There are three “flavor themes” – Afro-Subsaharienne, Afro-Caribéenne, and Afropéan – that evoke Africa, the Caribbean, and Europe. Diners can mix and match selections from these themes. The entire menu is gluten-free. Note that fish is not cooked in advance, so be prepared to wait a bit if you select this menu item. We dined on chicken. 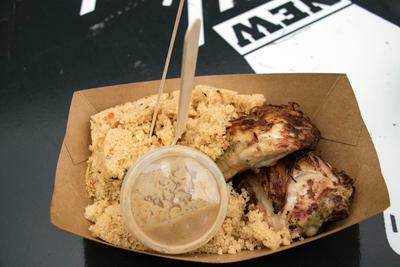 Tom selected the same chicken dish and sauce he brought home for the two of us when he went to the Africa Now festival - the Afro-Subsaharienne version that consists of drumstick, thigh, and back prepared in a marinade of Cameroonian Penja pepper, and Cacahuète aux Epices du Cameroun (peanuts and Cameroonian spices) sauce. 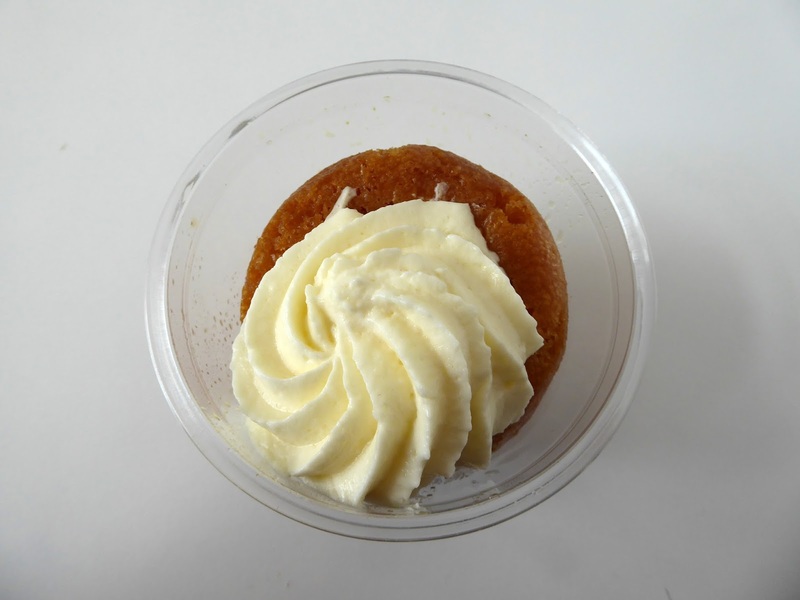 He chose the Afropéan Attiéké (manioc semolina made with olive oil, semi-dried tomatoes, and African herbs and condiments) as his accompaniment. 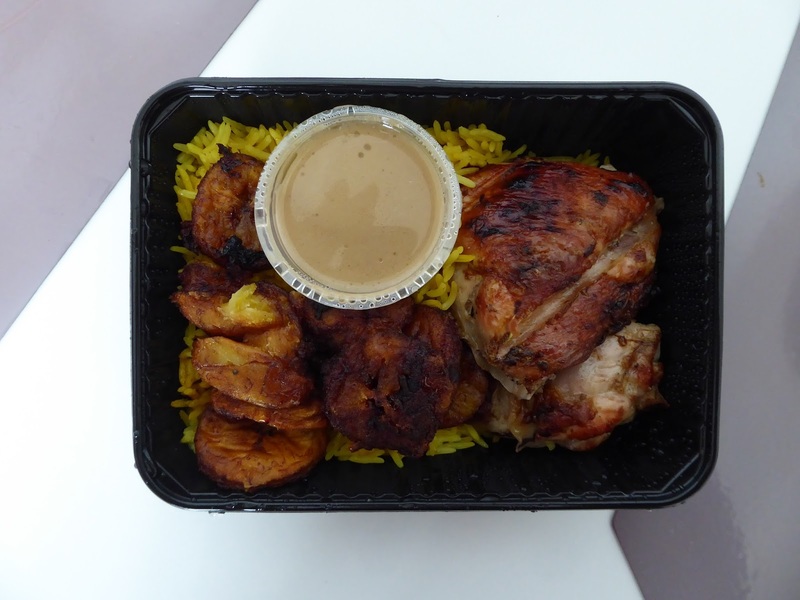 All my selections were from the Afro-Caribéenne theme: chicken prepared in an Antillean colombo-turmeric-ginger marinade, Patates Douces (white and orange sweet potatoes sautéed with herbs), and Coco et Vanille (coconut and vanilla) sauce. As a beverage, we each selected a house-made soft drink. Tom chose Framboise hibiscus parfumé à l’eau de rose (raspberry-hibiscus drink perfumed with rose water) and I chose Gingembre passion (ginger and passion-fruit drink). We carried our orders over to a tall table in front of the food truck and tucked into them as music from Africa and its diaspora played over the truck’s sound system. Meals are served in cardboard boat-like containers and the utensils supplied are wooden forks and knives. Tom was thrilled with the food he ordered. I loved my chicken and sweet potatoes but felt that the coco-vanilla sauce would have been more appropriate for a dessert course and asked for a serving of the spicy peanut sauce to finish my meal. I quite liked the ginger-passion fruit drink but Tom found his raspberry-hibiscus drink a bit too sweet. 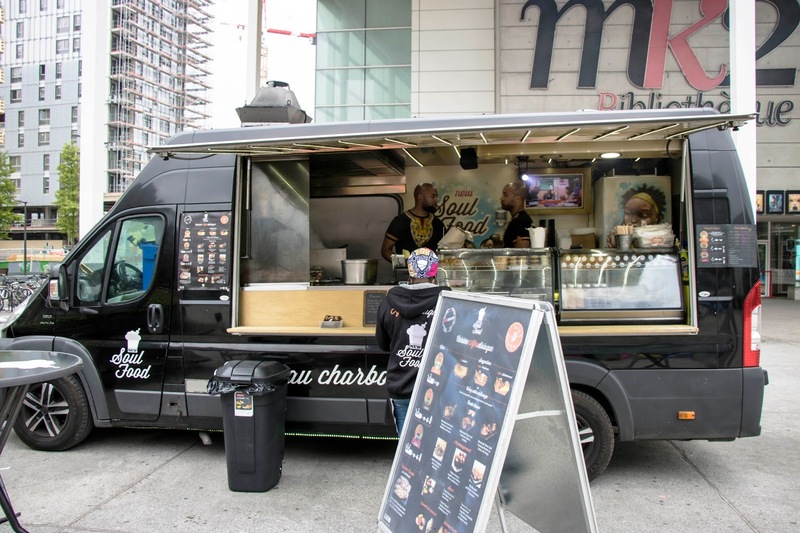 We were looking forward to trying some of the signature desserts that the truck offers, but alas, none were available that day. 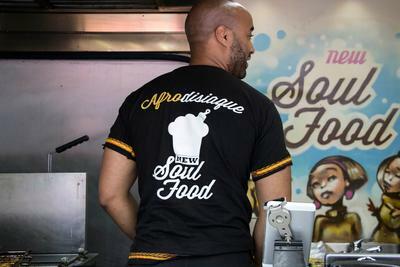 New Soul Food is the brainchild of Rudy Laine, a culinary professional trained in cooking and pastry making. He and his brother Joël, who is also a chef patissier, are proudly introducing a new way for the French public to experience African and Caribbean cuisine. 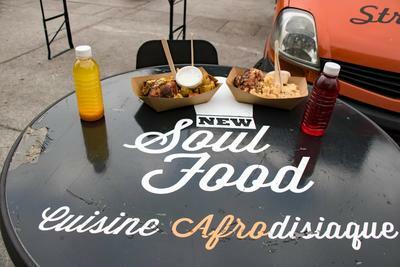 We look forward to returning to New Soul Food to try the Afropéan chicken, which is marinated with herbes de Provence prior to grilling, and the Afropéan Yassa sauce, which made with mustard, onions, and lime. We also look forward to trying more of their desserts. Because New Soul Food is an itinerant kitchen, its location changes frequently. 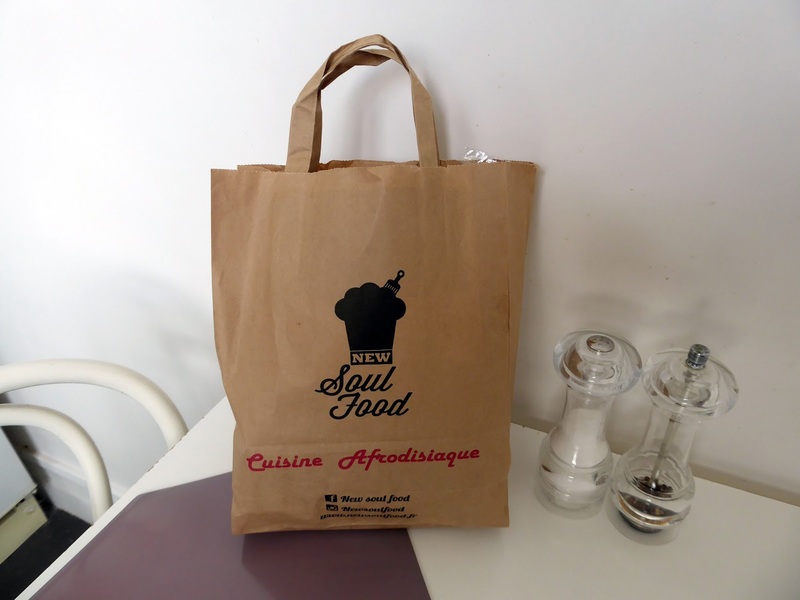 To access the schedule, visit http://newsoulfood.fr/actualités.